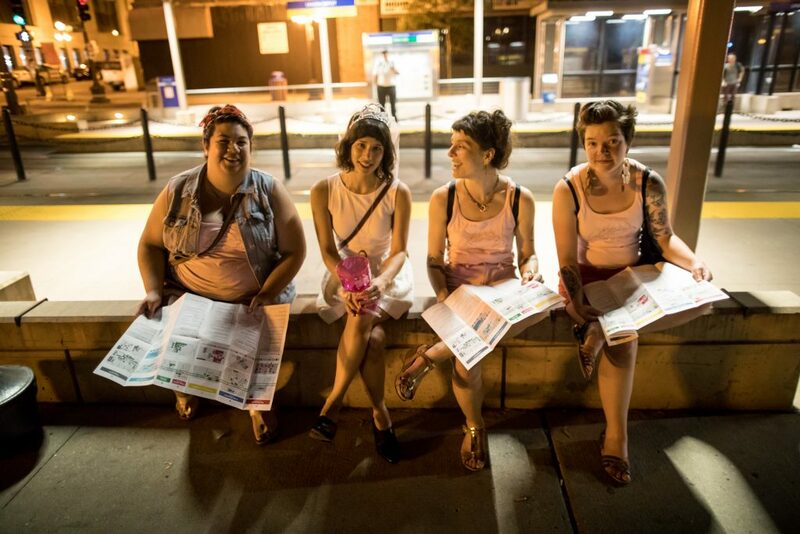 This year Northern Spark is two nights until 2am! Programming is the same on Friday and Saturday unless noted on each project description. Plan your night(s) using these tools or just wander and discover! Customize your list of projects to see, including times and locations, with the My Night feature. Simply log in with your email address and start building your schedule. And remember, this website is mobile ready and holds all the information you need on the go – project listings, maps, timed events, and more. Northern Spark Information Tents are a great way to get essential questions answered. Info Tents have maps, night-of festival updates, first aid supplies, and large print maps. Stop by and chat with a friendly volunteer. Once you’re at a festival venue, all projects are marked by tall signs with red Northern Spark flags. Inside Minneapolis Central Library look for additional stanchions with wayfinding and project information. Some projects are in unconventional spaces and may not have ADA access. Projects identified with a wheelchair symbol are ADA accessible. All festival venues are ADA accessible.